Seems like CBS is putting out a lot of TV Show News as of late. The newest one is the Latest Details on the Crossover Episode! In "World's Finest" The Flash needs help trying to get home, while Supergirl needs assistance with stopping Silver Banshee (her newest coworker and co-assistant, Siobhan) and the return of LiveWire. CBS uses words like "Handsome Hero", and "Super Dreamy"
if she does have a crush on him after meeting him for five seconds. except for Non and Hank Henshaw/Martian Manhunter. I'm really excited for the episode, LiveWire is one of my favorite villains on the shows so far! i.e. Supergirl inadvertently creates her. 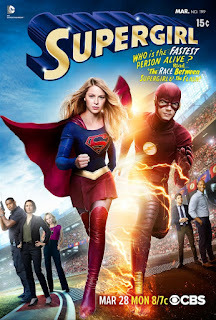 I wouldn't doubt that a race between Supergirl and the Flash would happen at some point! What's the one thing you'd like to see during this episode? How do you feel about the Girl of Steel having a crush on The Fastest Man Alive? Hi Natalia, I must be old, because I haven't seen any of these TV series! I mean I know who Supergirl is but that's about it. Is The FLASH who we used to call Flash Gordon? LOL. But I did want to let you know your website is amazing! I love your graphics, it's all just so much fun. Firstly, thank you for commenting! Secondly, I just googled Flash Gordon to find out the difference, because like you, I've heard of him, but didn't really know who he was. LOL. While they both started off in the comics, Flash Gordon(1934) and The (1st) Flash(1940), Flash Gordon was(and I quote from yahoo answers because I thought it was funny) a d-bag football player that was shot off into space with a soundtrack made by Queen. The Flash is the Fastest Man Alive and part of the Justice League (Superman, Batman, WonderWoman). The first season of The Flash is on Netflix, you should watch at least one episode. It might not be your cup of tea, but it might be a good cookie! :) Thanks again for visiting my site! I actually hope they don't do a teased romance between these two. I loved Supergirl when it first debuted, but as of late it's been getting bogged down with too much high school drama. It's the same mistakes that Arrow has made the past season. Flash seems to hit that balance of action, drama, and fun perfectly. I hope they learn from Team Flash and make the adjustments they need to make that show as good as it should be. I touched a lot on this in my wrap of of the last television series (http://boofersonj.blogspot.com/2015/06/my-wrap-up-of-2014-15-television.html). Arrow started to fix this, but Supergirl is getting worse each week. I realize they are trying to hit a young female demographic, but you don't have to make this 90210 with superheroes.